BOSU Pro Balance Trainer - featuring a new, improved design and durability. BOSU PRO has a bladder weight of 8 pounds and a dually over-molded platform for extra strength. It has a smooth, non-skid, non-marking base. With a blue dome with logo detailing, light grey clamp and platform. BOSU, which originally was an acronym for Both Sides Up, has evolved beyond the product to now mean Both Sides Utilized and to become a mindful approach to exercise that is a step beyond traditional training. BOSU Training is about expanding movement capabilities, reshaping bodies and strengthening minds. 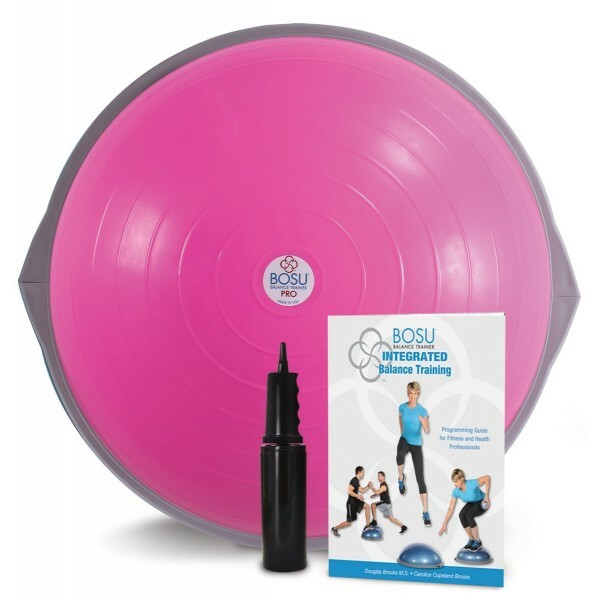 Appropriate for everyone from elite athletes to kids to weekend warriors trying to stay in shape, the Bosu balance trainer helps you strengthen and coordinate several major muscle groups, including the muscles you don't see. The Bosu targets your core muscles--the muscles around your abdominal and back area--while you perform a host of different workouts, from squats and bicep curls to lateral shoulder raises and hip extensions. As a result, you not only gain strength, trim and tone, but also improve your balance and coordination along the way. Why Competition Kettlebells? Unlike classic cast iron kettlebells, competition kettl..